Have you filed your 2015 income tax return? If you’re like many Americans, you’ll likely wait until the last possible day to submit your return, which for this year is April 18th thanks to this little-known holiday that falls on our country’s normal tax day. 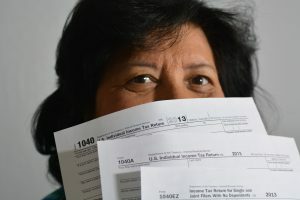 So if you’re one of the folks currently doing the tax time scramble, here are some tips to help ensure you have the forms that you need to complete the health care portion of your 2015 federal income tax return. They differ, depending on whether your coverage came from the Marketplace or another source. If you had Marketplace coverage, whether or not you received premium tax credits…you should’ve received a Form 1095-A, Health Insurance Marketplace Statement. If you did receive a discount this form will have the information you need to help you reconcile any credits, so make sure it’s correct. If you had coverage through your employer, a retiree plan, the Small Business Health Options Program (SHOP) or COBRA…you’ll be getting a Form 1095-B, Health Coverage or Form 1095-C, Employer-Provided Health Insurance Offer and Coverage. Don’t worry if yours hasn’t come yet. You don’t need it to file your taxes. If you had Medicare, Medicaid, or the Children’s Health Insurance Program (CHIP)…you’ll also receive a Form 1095-B Health Coverage. You also won’t need to worry if you don’t receive one. Some providers don’t send them to their customers, only the IRS. If you didn’t have health insurance in 2015…see if you qualify for a health coverage exemption. If not, you may owe a penalty or fee. That should take care of most situations that arise. If you still have questions or aren’t sure how to proceed, contact a tax professional for more information. The clock is ticking!